In this project, we converted a living room wall into a library and home office. A printer, electronics and their unsightly wires are hidden behind sliding doors, on a pull out tray for easy access. 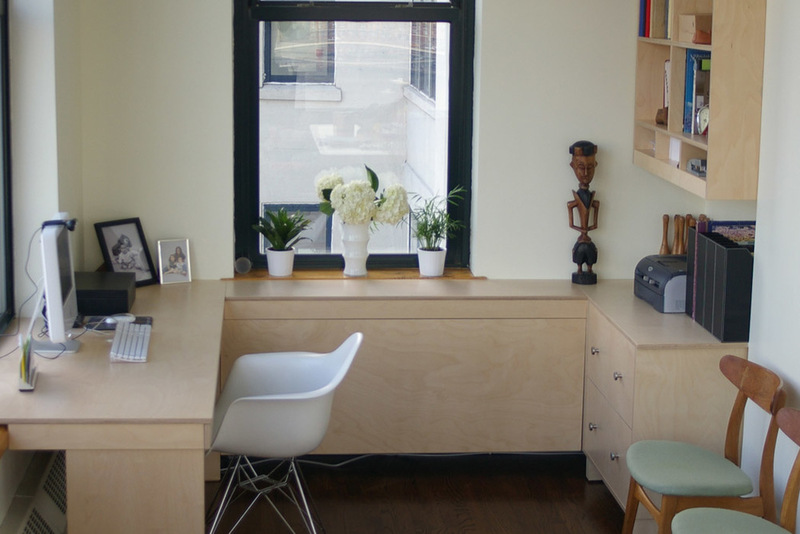 In an under-utilized corner within this Dumbo loft, we installed a desk, shelving and drawers. 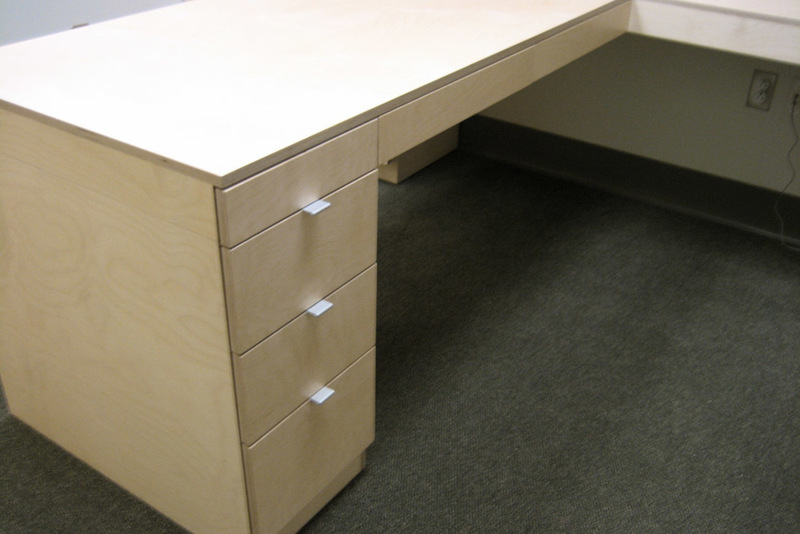 Constructed of birch, the desk is cantilevered over a radiator. This media cabinet, home office hybrid floats above the floor to keep this relatively small room light and airy. The drawer pulls are constructed of wood and the break in the desk height was intentional to accommodate the window, while maintaining as much desktop space as possible. 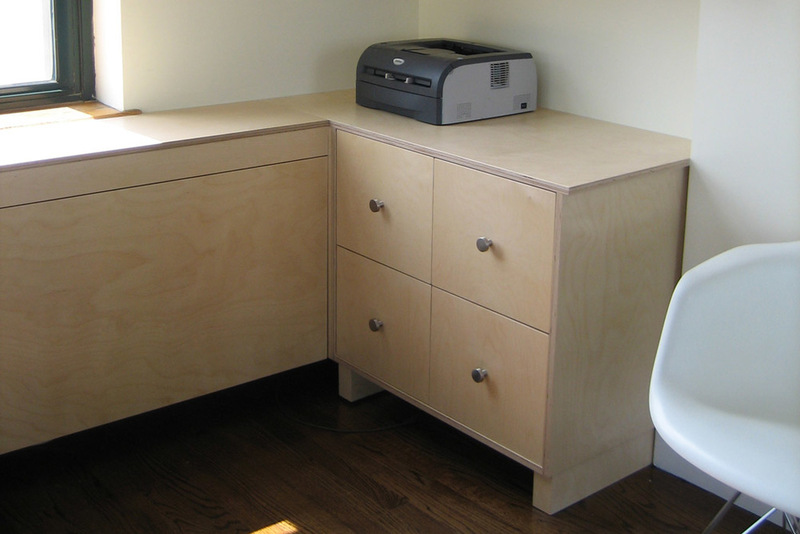 This T-shaped desk with cubbies is constructed of natural birch. We converted a home office into a playroom in this Tribeca loft. We installed a desk so that, in this case, the father, can continue working here, but this room is all about toy storage. Along the adjacent walls pictured here, we’ve built extensive cabinets and and shelves, designed to rest flush with the room’s existing features. We built an extensive bench and storage system along the room’s longest wall, creating a massive amount of storage space while maintaining the sleekness of the loft. The benches extend into the living room, creating cohesion and flow within the space. Above the desk, we installed cabinets with sleek sliding doors. White accents complement the natural birch finish throughout the space. Below the benches are cabinets and toy carts that kids can wheel in and out for easy access and quick clean ups.